The interior design that converted legendary Zorbas Bar to Chapel is part of our strategy to return to our #CycladicRoots. This has to do with giving back to the Cycladic interior and exterior spaces the elementary, indigenous qualities that have been eliminated in the past 40 years in the name of modernity. Arcs have been traditionally employed in the Cyclades to generate enclosure when there was no concrete. Double arched roofs, a 3d geometry that is defined by arcs in various directions, are the only way to make a building when all you have is stones. The interior space feeling of a double arched roof is remarkable, and it is closely interwoven with Cycladic churches are chapels. With that in mind, the decorative 2d arcs that were found in the walls of Zorbas, were turned to a more complex, 3d double-arched roof, through a very accurate geometrical operation. The result is a cosy, welcoming, almost devout space that is at the same time extremely mykonian and extremely contemporary. As part of our #CycladicAlgorithm philosophy, we have added to this space two main elements. The first is a very impressive central bar, which is essentially a 3d loop that is formed by morphing various functional bar typologies. Its is a computer programmed form that is materialized in indigenous Cycladic construction. 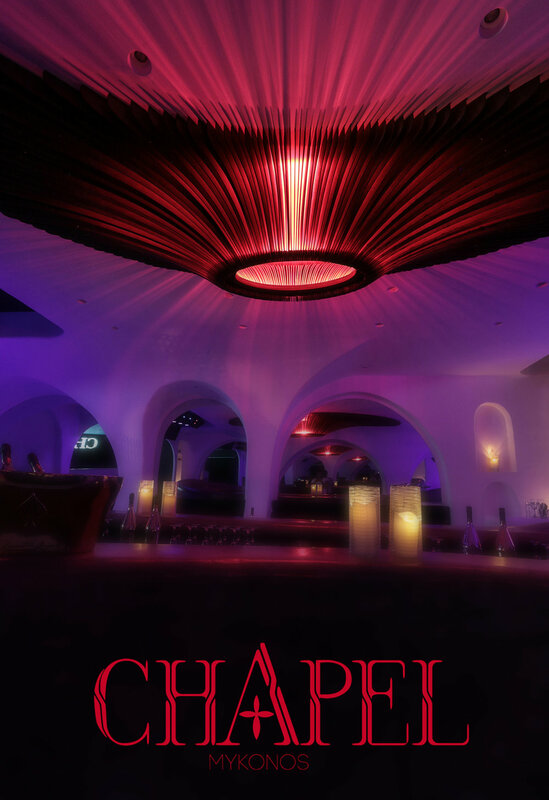 The second is Chapel’s trademark Chandelier. 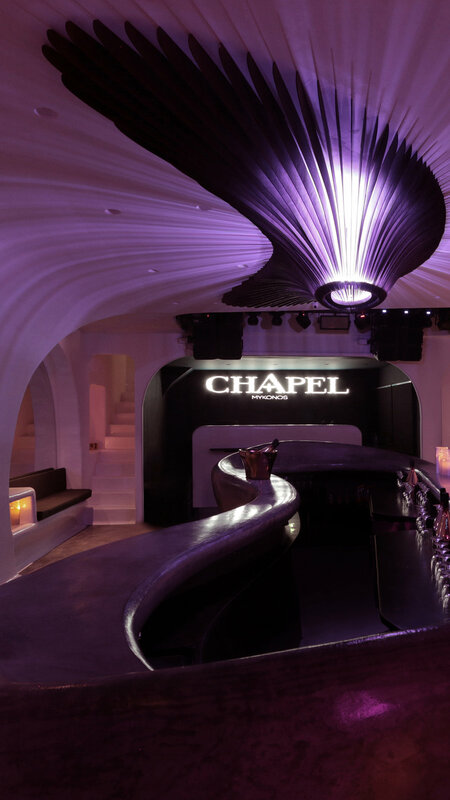 A unique piece we designed and fabricated for Chapel, is an ultra – modern rendition of a traditional central chandelier, made of 180 custom cut wooden pieces. 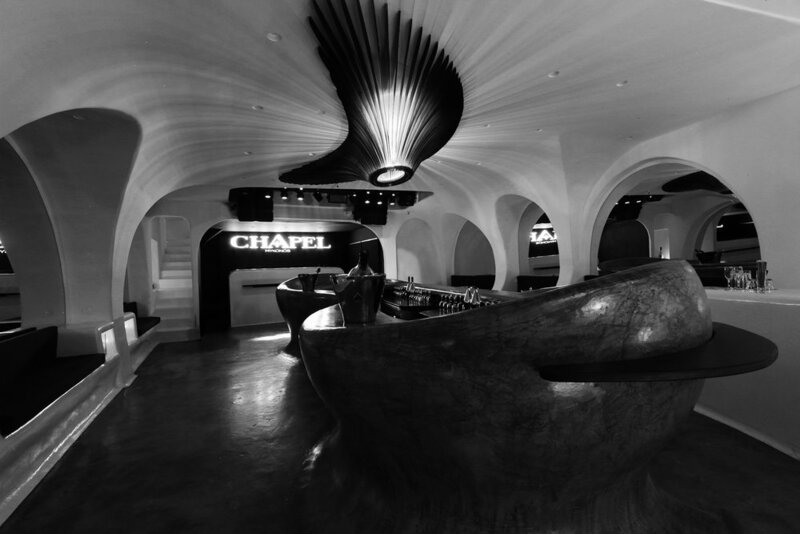 It’s name and architecture closely interwoven, Chapel aims to offer its patrons a very original Myconian experience, that blends carefully everything we have loved about the Greek islands with a very avant garde experience.